Artemision Bronze - Zeus or Poseidon? : A Thunderbolt, if Zeus, or a Trident if Poseidon. Artemision Bronze: a bronze statue (h.209 cm) datable to 480-470 BC approximately and preserved in the National Archaeological Museum of Athens. 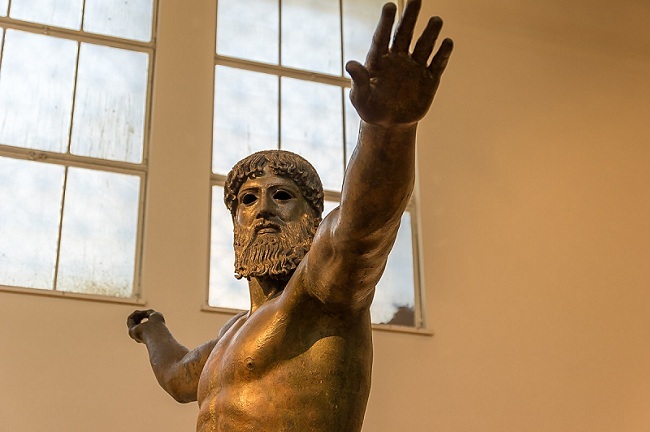 It was found in the sea beds in front of the Artemisio head, in today's Euboea, and is one of the very few original bronze works that have come to us. It represents either Zeus or Poseidon and would have held either a thunderbolt, if Zeus, or a trident if Poseidon. Speakers: Dr. Beth Harris and Dr. Steven Zucker. Created by Steven Zucker and Beth Harris.